In premises of the City Youth Centre Brcko, Bosnia and Herzegovina, on the 28th of April, partner LIR Civil Society organized public hearing based on results and recommendation of the “Comparative Analysis of the Role of Civil Society in Providing Social Welfare Services in the Western Balkans”. Main objective of the hearing was to present recommendations for advocacy in order to improve the delivery of social services in Bosnia and Herzegovina, and to highlight the importance of the role of NGOs in the provision of social services and the need of strengthening the partnership between the government and the NGO sector. Representatives of Government of Federation of Bosnia and Herzegovina and Republika Srpska, from two entities and Brcko district, came to give their support to this project and IRIS network, and also to participate in discussion about future collaboration between civil society and government. 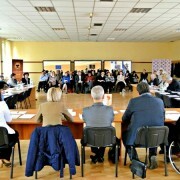 About sixty representatives of civil sector and members of IRIS network took part in public hearing, amongst which IRIS partners presented concluded activities and results in project Improving the provision of Social Service Delivery in South Eastern Europe through the empowerment of national and regional Civil Society networks” so far. Public speaking was concluded with a discussion on the best ways to improve the quality control system of social welfare services in the public and NGO sector in which many participants had the opportunity to express their views and recommendations.